In January of 2000, a Gelding eventer had never recovered from a viral infection. Vet prescribed antibiotics, but no effect. 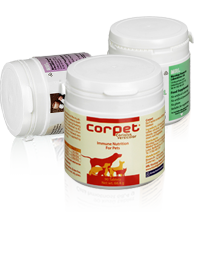 The owner and vet made a decision to try Coriolus versicolor supplementation. In March, while on maintenance stage of Corpet, the horse ran very well at an international horse show and obtained 8th place. In November of 1999, a 12 year old Drought horse with approximate body weight of 500 kilos has chronic sarcoids situated around stifle area. New sarcoid growths were observed around the inside of back legs. The horse had previously received heavy metal cream for the established sarcoids around the stifle area. The owner and vet made a decision to try Coriolus versicolor supplementation. Initiated in November 11th, 1999. Days 1-60 -50 grams per day and mix with meals in the morning. In March of 2000, with Corpet supplementation, new sarcoid growths i(nside back legs) were seen to regress and eventually totally disappear. A horse weighing 600 kilos with sarcoid established near the eye. On November 3rd, 1999 the owner and the vet made the decision to try Corolus versicolor supplementation. in November 11th , 1999. Again, a noted improvement in white Blood count, with regression in sarcoid size after six months of supplementation.